This is the fourth installment in our series on risk, in which our research team leverages new investment risk analytics in Stylus Pro to demonstrate how historical and forward-looking stress tests can provide deeper insight into fund performance across various market regimes and hypothetical scenarios. In this post, we take a more granular look at a group of 38 funds within the 2020 target-date vintage, which is the vintage intended for investors planning to retire in or around 2020. Near-dated target-date funds (TDFs) may have widely varying allocations to growth assets (primarily stocks). 2020 TDFs average approximately 50% in growth assets and 50% in bonds, or preservation assets, according to a 2017 Morningstar report1 and corroborated by returns-based style analysis.2 Some TDFs continue to reduce exposure to growth assets past the retirement date (through funds), while others have a landing point at the fund retirement date (to funds). Generally, we would expect the former to be more aggressive with higher exposure to growth assets. These and other allocation differences allow funds of the same vintage to match different investor profiles, which may also have different tolerance thresholds for different shocks. 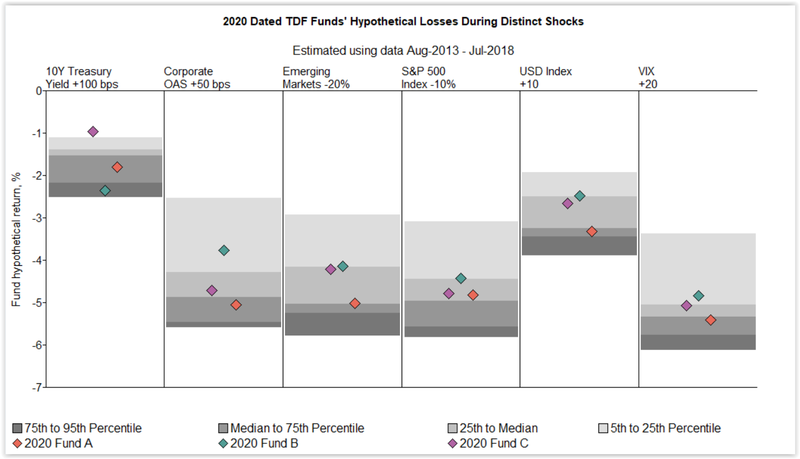 In the below chart, we look at a universe of 38 unique TDFs dated 2020, using a single share class from each fund and estimate their sensitivity to six individual shocks,3 none of which has occurred on a monthly basis4 within the past five years. We also select three TDFs within this vintage to compare against the entire peer group (indicated in gray) in order to more explicitly illustrate varying sensitivities across a group of funds that share several common characteristics. The three selected TDFs have similar five-year standard deviations (approximately 5.2%) and similar returns-based style analysis estimates of growth asset allocations (46%-48%). While we don’t see anything that hints at the extreme sensitivity of some near-dated funds in 2008, we do see a broad range of sensitivities as indicated by the peer distribution spanning the 5th to 95th percentiles. 2020 Fund A shows average projected sensitivity to a hypothetical domestic equity shock, somewhat higher to stress and credit shocks, and particularly higher sensitivity to global shocks (Emerging Market and USD) than the other two funds. 2020 Fund B is projected to be less sensitive to the equity and stress related factors (it is in the top quartile of its peers), but it is potentially one of the most sensitive overall to a sharp rise in rates. 2020 Fund C shows average projected sensitivity to potential domestic equity and credit shocks, low sensitivity to global and stress shocks, and very low sensitivity to a sharp rise in rates. These differences (given that we took funds with similar growth asset estimates using returns-based style analysis) are likely to be primarily due to sub-strategy allocations. Fund B’s preservation asset exposure estimates appear to be heavily weighted toward Treasuries, while Fund A seems to be more geared toward corporate bonds. Fund A also appears to have a larger estimated allocation to non-US assets than either of the other two funds. Fund C’s relative lack of sensitivity to Treasury rates may be attributed to a higher estimated allocation to cash and non-US bonds. If we have a strong opinion on what a future shock may be, then we can evaluate a broad range of funds or portfolios against that specific scenario within seconds. Without the strength of conviction, scenario analysis can provide insight into fund sensitivity against an array of scenarios. This multiple scenario approach to fund analysis can help to ensure that no fund exceeds a threshold loss estimate in any scenario. 2DISCLAIMER: MPI conducts performance-based analyses and, beyond any public information, does not claim to know or insinuate what the actual strategy, positions or holdings of the funds, portfolios or organizations discussed are, nor are we commenting on the quality or merits of the strategies. This analysis is purely returns-based and does not reflect insights into actual holdings. Deviations between our analysis and the actual holdings and/or management decisions made by funds and/or organizations are expected and inherent in any quantitative analysis. MPI makes no warranties or guarantees as to the accuracy of this statistical analysis, nor does it take any responsibility for investment decisions made by any parties based on this analysis. 3The six factors we selected to shock are: 10Y Treasury Yield, a measure of yields paid on 10-year U.S. Treasuries; Corporate Options-Adjusted Spread, a measure of the spread of a fixed-income security rate and the risk-free rate of return, which is adjusted to take into account an embedded option; Emerging Markets, a measure of emerging market equities performance; S&P 500 Index, a measure of the performance of 500 widely held common stocks of large-cap U.S. companies; USD Index, a measure of U.S. dollar strength relative to a basket of foreign currencies; VIX, a measure of the stock market’s expectation of volatility implied by S&P 500 Index options. 4VIX did spike by 20 points on Feb. 5, 2018, but the index level was much reduced by month end.